I don't remember a time in my life I wasn't making something from any materials available. I began college studies in art but, being practical, finished a degree in sociology. That led to a career as a social worker. When our son was born, I returned to art, specifically to fiber arts. But once a potter friend introduced me to stoneware and porcelain, it was as if I had come home. Clay took over. Juried art shows were a regular part of life for my husband, son and me for 20+ years. I became known for animal forms with happy, endearing expressions - both in sculptural and functional work - at shows across 5 states. Moving to Wilmington, N.C. brought more contact with wonderful artists and opportunities for workshops with two visiting artists from China, as well as other experts. 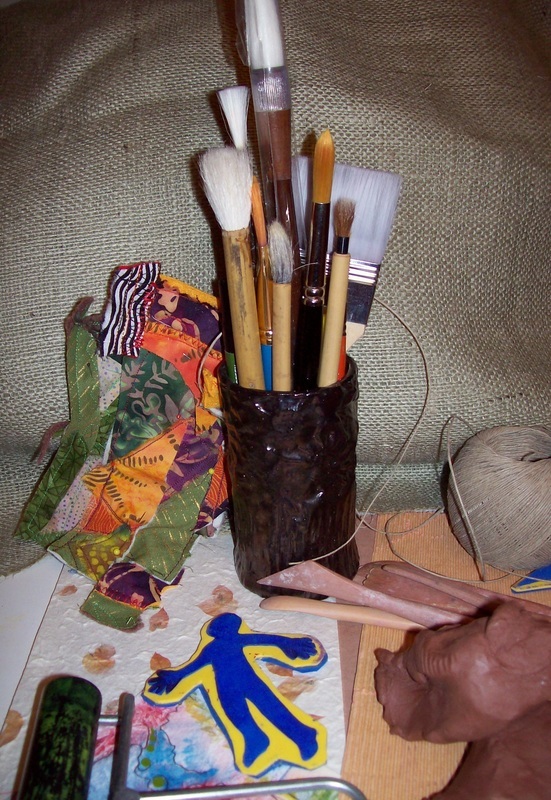 I primarily work in clay and mixed media. In clay I am a hand-builder - animals and happy faces are often the subject matter. I enjoy raku firing as often as I can. My work's focus is on lightening the mood in daily life with a smile here and there. Something special I’ve created for that purpose are the HeartStones – a means of causing a daily lift in mood. There have been awards and ribbons from exhibits and festivals, but my most cherished prize is the number of smiles the pieces collect along the way. I make things because I HAVE to make things - it's an ongoing need in my life. The extra benefit comes from the smiles that result from pieces born during the collaboration with my happy muse. I am primarily a hand-builder. The idea forms in my head and my hands work with the clay to bring the idea into form. Most of my work is single-fired, which means the work is brush-glazed when the pieces are bone dry. This requires a careful hand to avoid breaking or collapsing the pieces before firing. It also gives the glazing a slightly different look because the glaze absorbs differently and sometimes brush marks become part of the work. All my designs are original and textures are made with stamps and roulettes I design and create myself. I tend to work organically in multimedia work, allowing the piece to help direct the process. I'm a great believer in the value of play in the "work" of art.